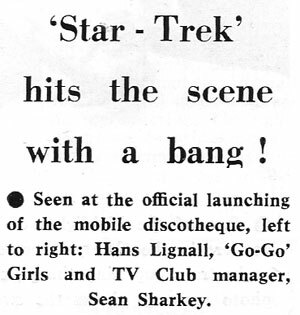 In September last year we posted this advert from 1971 for Europe’s largest mobile Discotheque ‘Star Trek’. We introduced “disco music” to ballrooms all over Ireland at a time when they either danced to a contemporary popular showband such as Dickie Rock, or a country & western one such as Big Tom. You can see the full comment from Hans here and other comments on Zhivago from Hans & Freddy Bailey here. I’ve scanned and posted below more information on Star Trek, including a pic of Hans, from the Jan-Mar 1971 issue of Showcase magazine. 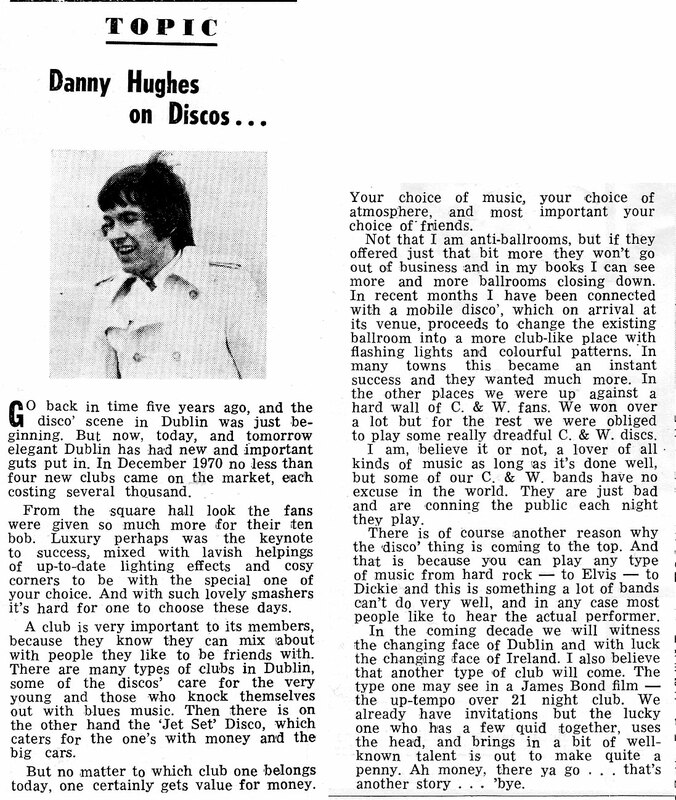 Also scanned from this issue are pics from 2 Ages and Sloopys and a couple of really interesting articles on the rise of clubs/discos and its impact on the Showband scene. Update: Hans has posted a comment on this post in which he advises that...The girl dancing at the top of this page is Marie Mooney. Marie was one of the 10 girls that were in the group “Go Gos Galore”. Together with Michelle she would work out dance routines for the other girls. 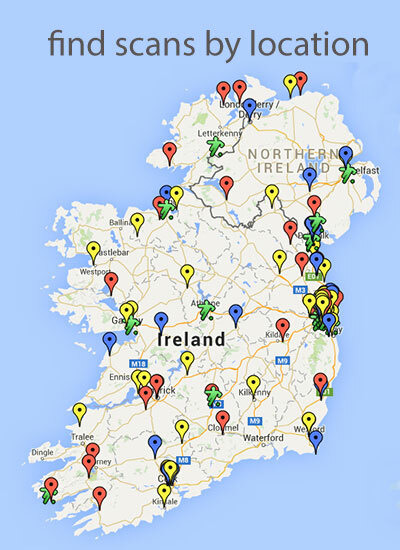 You can view all previous posts on Irish Discos, Nightclubs & Pubs here. A fantastic post – thanks so much …. Hi Kieran, glad you liked it. The girl dancing at the top of this page is Marie Mooney. Marie was one of the 10 girls that were in the group “Go Gos Galore”. Together with Michelle she would work out dance routines for the other girls. I always wanted them to dance as a group instead of doing anything freestyle as it looked a lot more professional on stage………the same way that Pam’s People in England used to dance. They had about 10 different routines, and each time a new record came out they would decide which routine suited it best. The other photograph was taken on the opening night of Star Trek at the TV Club in Harcourt Street and it shows Marie in the middle of, Mary on the LHS and Michelle on the RHS. This was the launch of “Star Trek” and from memory our first gig was in White’s Hotel in Tipperary. I do remember one gig on Christmas night in Athlone, I told the owner of the ballroom that it wouldn’t work but he wanted to give it a go. In those day I had a set fee, or 55% of the door whichever was the greater………..well we set up the show and only 4 people turned up…………..needless to say I did feel guilty, but we did drive there and set it all up, so there were expenses involved. I am trying to locate some more printed material and as I do, I will post it here. Well you have a good memory, as yes I did race a Blue MGB – HZL600 and then a White MGC – TZO 700. I think the last time may have been at Phoenix Park in 1972. I also made a futile attempt to race a Mercedes-Benz 600 in production cars at Phoenix Park, but I was never successful as the brake fluid kept on boiling for some strange reason! There may also have been a Mini in there somewhere as well. In our group, there was also a chap who shall remain nameless, who would rent a car for the weekend, and race it at the park, bringing it back on Monday with tyres as smooth as billiard balls, much to the bewilderment of the rental company!! Thanks for your prompt reply , more questions you are listed as entered for Mondello May 12th ( first event)in an MGB ,did you compete ,published results only show first 3 .Secondly was the Mercedes Irish reg ,what was the history , any photos , incidentally the MGC survives , I have not seen it , but I suspect it is not roadworthy. No I never raced at Mondello. Apart from several times at the Park, I also raced in the North at Dundrod. The Mercedes-Benz 600 was owned by a good friend Brian Leonard, who must have been bonkers as I must have been too, to let me race it. It was dark navy blue with a light grey Velour interior, and the rego number was GZU600. Unfortunately I don’t have any photographs of the car. The only item I have is a very short article in some car magazine which mentioned Charlie Gunn – another good friend, and I, and the fact that we didn’t do too well. I do have a photograph of the MGC at the Park. I think it’s from 1972, and it was taken shortly after I repaired it after having a fairly major accident between stages of the Circuit of Ireland. It is now owned by Karl Moore-Lewy and apparently has a Rover 3.5 litre engine fitted, but it is also in disrepair, and in need of a full reno. I have no idea where my blue MGB (HZL600) is?. I would like to know the whereabouts of my blue Jaguar E Type which I loved. I had it at the same time as the MGC, and I have no idea what I did with it before I left Ireland. It was a 2+2 in blue with a grey leather interior, with a 4.2 litre straight six. I think the rego number was AWA380. When I was living there I used to change cars about every 6-9 months, and nearly always from Murphy & Gunn, except for a Rover 3.5 Coupe which I bought from a place near the canal. If you need any further info, or photographs, just let me know and I’ll see what I can rustle up. Was talking with Richard St John Young ,he was first on the scene of your COI crash , he recalled you and your navigator Brian Archer ( badly broken leg ) ,he has good recall of the facts , your last email is spot on re the C , another question were you born in Ireland , the friend you posed the question about the reg number of the C believes you are dutch . Edward, I’m a “Swedish Leprechaun”, in so far as that my father was Swedish, and my mother was Irish, and yes I was born in Ireland. Have you found my E Type yet? Oh and there was also a blue TR6 that I bough brand new and kept for only 4 weeks as I hated it……….but never raced it. Those go go girls were some bit of stuff! The two ages also had a night for suede heads. I think it was a Tues. I was 17 in the Irish army so had short hair.. the two ages was the only club that let us in..great times. As I recall, it Hans Lignell never went on the road. Justin James was the DJ who operated Star Trek mobile discotheque. Credit where credit is due, Hans. Joan I have no idea who you are, or why you would make such an inaccurate statement as the one above. Star Trek was mine 100%. I designed it, I funded it, I built it, and I went to EVERY ballroom throughout Ireland when I was there. At the time Justin James was the DJ and yes he was also at every gig. I left Ireland in 1973 and I am unable to remember what I did with the truck and all the equipment. I may have sold it, and if that was the case and it continued to be utilised by Justin after 1973, then naturally I wasn’t there. So please get your facts correct before you say anything next time. Actually, I was on the road with Justin in 1971 and 1972 and we saw a lot of country towns, Carlow sticks in my mind for some reason, but I never met you. The other girls don’t remember you either, like Liz and Wendy, so….? By the way, whatever happened to Justin? The last I met him was in Dublin in 1985, but we both in a hurry, so we didn’t get to renew our acquaintance. Also, he had his wife with him. Joan, I’m not sure if Justin was working for other outfits at the time, but I started Star Trek in 1971, it was during the prolonged bank strike, and he came on board immediately. He was our only DJ so you may be mixing up the dates when you saw him on the road or he may have been doing a gig with someone else. At the same time, I was the manager for John Farrell & The Groundhogs, and yes we had two girl singers, from memory their names were Liz and Wendy. There was also the “Go Go’s Galore” dancing girls, but I don’t think any of them were called Liz or Wendy. We are talking over 40 years ago so my memory is a tad on the vague side. As for what’s happened to Justin, I’m sorry but I have no idea as I have not seem him since those years. launched and funded the Star Trek Disco.Justin James (Jim O’Reilly )disc jockey. I believe Justin may have had ieventually owned or was minding the lorry and gear,early mid 70.s.At that stage it was what appeared to have been a Fyffes yellow Bedford. Justin had at time driven a Chevrolet Corvair (white). Star Trek was innovative and very professional and a wonderful idea. Would anyone have contact with DJ Danny Hughes who presented “LIke Now “band show , on RTE Jan.19. 1969. RTE have no recordings of the show in archives . I wonder if Danny or anyone might have kept any ? I’ve googled everything can’t find a way to contact him . Has he still got a shop in Tipp town ? Hi there, Danny will I’m sure be delighted to read your comments. Had the pleasure of working alongside him on “Like Now” as guest presenter ‘DJ Lee’. Think all the shows were taped over but I’ve passed on this link to Danny who may have other info on them.